We had another three day weekend thanks to Pentecost. After growing up in the states with separation of church and state, these religious holidays always catch us by surprise. Inevitably we forget to do our grocery shopping, and with everything closed down, well... it gets kind of interesting. My eyes started feeling well enough Sunday afternoon for a little hike in the forest. We went with some friends, and though I have no idea where we ended up, it was amazing. 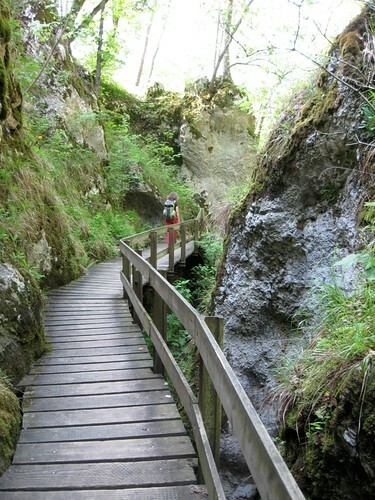 The trail moved upwards between high stone cliffs that had been etched by water probably thousands of years ago. 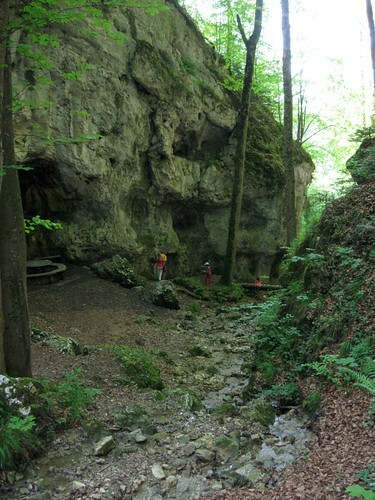 There were little caves at our sides and a small rivulet running under our feet. Someone had meticulously built wooden bridges and staircases leading up over this whole expanse. My pictures don't quite do it justice, but it was really breath-taking. At the first summit we reached a prairie full of families playing frisbee, sunbathing, and barbecuing. There was even a playground for the kids. Just five minutes more hiking led us to another summit-- a restaurant and a pasture with camels! 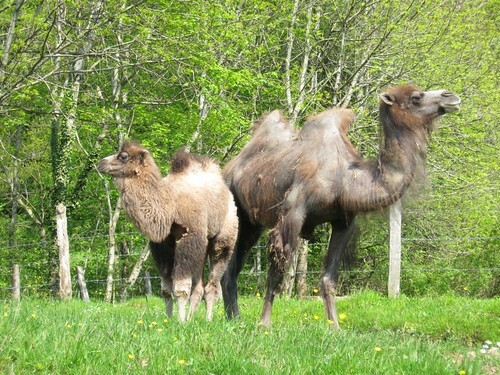 That's right-- camels in Switzerland! How funny is that!?! Even funnier, we were told that the Wanderweg, or the trail, that leads into the next village goes through this camel pasture. So naturally we decided to walk on this trail to get a better look at the camels. There was a mama and a baby, so just as naturally this turned out to not be the best idea. The mama chased us and growled. I didn't know camels could growl, but this one did. It was a very throaty kind of sound, and the message was very clear: Stay the heck away from my baby! Still, it was interesting. On Monday my eyes seemed almost back to normal. I spent a little bit of time in the garden putting yummy starts in, thanks to our gardener friends, and Sunburst managed to scrub the rat cage for the first time by herself. It took her All. Day. Long. Have I mentioned before that she's equal parts choleric and sanguine? She dives head first into a project and then gets completely distracted... I had to remind her what her focus was when I found her hours later walking the rats under our big shade tree, complete with harnesses she had fashioned out of knitting yarn. I realize these pictures are a tad blurry, but I swear it's not my eyes. Have you ever tried to take a picture of a running rat? I'm sure a few of you have! I'm off to get my eyes checked again tonight... hopefully all will go well. The pharmacist I spoke with on Saturday thinks that I was having an abnormal reaction to the dilation drops, so I don't think I'll be having those again. Today I can see just as well as before my first exam, and neither the sunlight nor the computer screen seem to be much of an issue for me. You can imagine how much I'm rejoicing! Thanks again for all your kind words over the last week. You mamas are the best! So glad your eyes are getting better. What a scare! How fascinating that trail is and to come upon a field with camels. 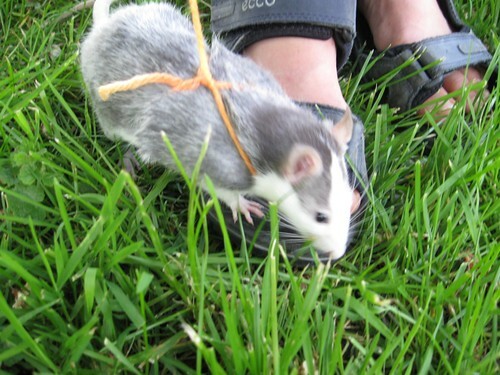 The rats look so sweet and full of character with their little harnesses going for a walk! Yay for seeing! What a scary reaction to have had! 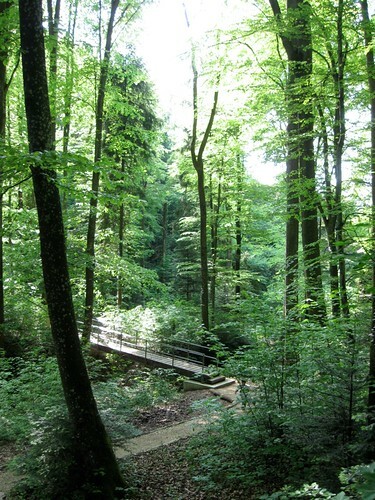 And it looks like you put your renewed sight to good use - the trail is gorgeous! And camels??? How funny! I think I must be parts choleric and sanguine!! I can't tell you how relieved I am to hear that your eyes are better!! As a fellow artist/writer/crafter, I can fully appreciate the horror of failing eyesight. 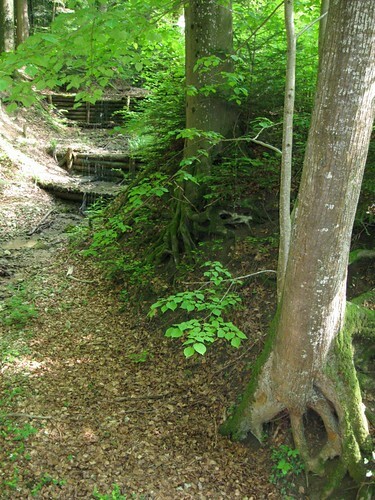 That was a beautiful hiking trail! Reminds me of places we hike in around Vancouver. 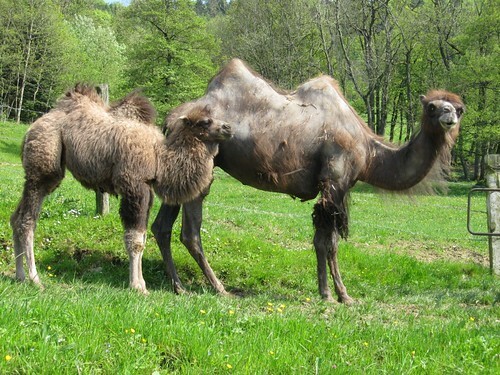 Thanks for helping me learn something new: that mama camels growl and are as protective of their young as bears are. Yikes! I know they cause your immune system grief, but those rats are really adorable. 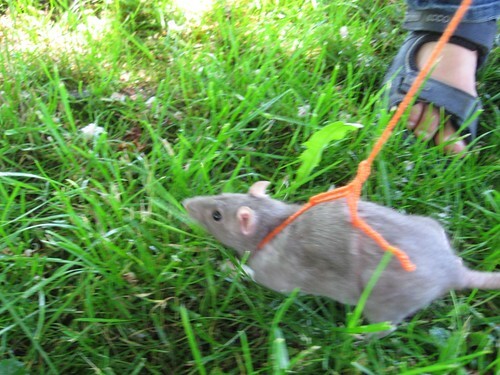 Oh my goodness...I've never seen a rat on a leash before...that is just too darn sweet! Beautiful nature pics as well, but I'm totally smitten with the rat!